Home Sport Is cricket safe enough? On November 27 2014, a bouncer was misjudged by the batsmen, resulting in the ball striking the batsman on the head just below the ear. An incident like this is so common nowadays it is perceived as a low-risk hazard of the game. However, this incident was different, a freakish accident which shocked the world of sport. 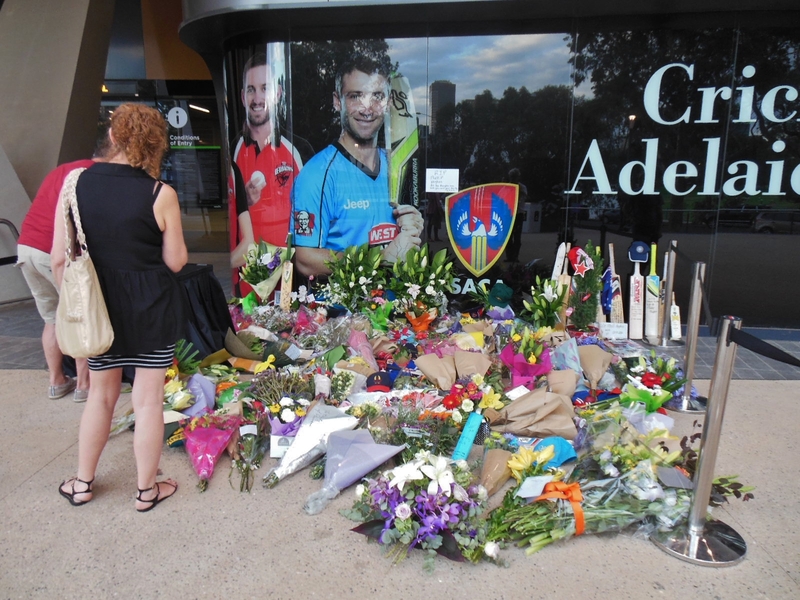 The batsman was Phil Hughes, who tragically lost his life following the incident. Although this distressing disaster was a freak accident, it poses a vital question: is cricket safe enough? An unusual correlation is that since the introduction of helmets, the number of times batsmen struck by the ball is on the increase. Such incidents include the infamous Stuart Broad case, causing him to suffer a broken nose. In this case, the ball had lodged itself between his grille and peak of his helmet. A similar injury was suffered by Somerset’s Craig Kieswetter who underwent surgery for a broken eye socket. Despite the necessity of helmets, they have changed the mind set of batsmen. Due to perceived safety, batsmen are encouraged to pull, hook and push balls that wouldn’t have been played 40 years ago. This complacency has contributed to these injuries. These incidents ensured a new British safety standard for cricket helmets was implemented. Unfortunately, the helmet worn by Hughes was an old style helmet, but, it’s unlikely even the new standard would have saved him. This is because it missed a vital area of protection, the area below the helmet which becomes exposed when a batsman turns his head. This, tragically, was how Hughes was fatally injured. Ideas have been proposed to increase the protection that helmets provide, such as, head of cricket biomechanics research at the University of Sydney, Rene Ferdinands’ idea to introduce a skull cap made of composite foam, designed to absorb 50-70% of the impact. However, with 5.5 ounces of cork and leather striking at 90+ mph, this impact could still be devastating. Another idea is to make the grille of the helmet larger, to cover more of the face and neck. This would provide more protection, but inevitably would add weight; reducing the mobility of the batsmen. It’s not just the batsmen who are at risk either. On November 29, just two days after the incredibly sad Hughes incident, an umpire was struck and tragically killed during an Israeli cricket match. This man was named as Hillel Oscar, the former captain of Israel’s national cricket team. The bowler’s end umpire positions themselves just behind the stumps at the non-striker end, to judge no-balls, so for someone who is standing as close to the wicket as they do, a question has to be asked: why don’t these umpires wear helmets? There are also fielding positions which arguably should require the need for protection. It is required that the wicketkeeper wears gloves and leg guards, but it is not required to wear a helmet. A helmet is worn when the keeper is closer to the wicket for a slow or spin bowl. They stand further back and take the helmet off when the ball is bowled faster. Another unusual correlation. Finally, and very much at risk, are the fans. In 2013 a fan was too busy chatting to his friends whilst watching the test between England and New Zealand. He was not paying attention, and the kiwi opener Hamish Rutherford hit the ball for six, striking the defenceless spectator on the head. Luckily for the fan, he escaped this incident unscathed. The commentator’s reaction to this was to say ‘oh, it’s a falcon’, which is an Australian slang term for someone is struck on the head. Here the media are overlooking the seriousness of such an incident, and a video of this incident is available to watch on the internet. The fans do not wear any form of protection, and if the spectator is caught taking their eye off the ball, the result could be fatal. In a televised game, if a fan catches a six, they are given money. This, put simply, is a form of encouraging the fans to put their lives at risk. Attitude to head shots is changing, but, this poses an important question: are the fans at risk? A problem arises though: what can we do to stop such incidents happening? For the fans it is unrealistic to put some sort of barrier in front of the crowd due to the reduced vision it will cause in rainy conditions. For the fielders, it is unrealistic to make them all wear protection due to the reduced mobility. For the umpires, helmets may reduce vision. Whatever is done, it needs to be something, and it needs to make a vast improvement in safety regulations.